INCOMING INVASION! NYCC 2018 you’ve been warned. 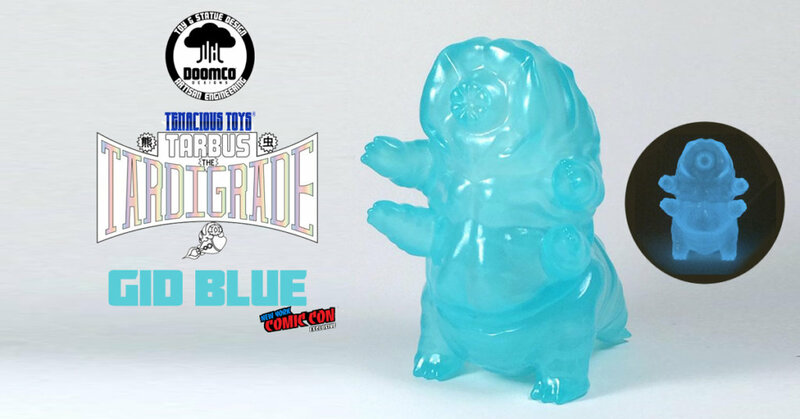 Our lads at Tenacious Toys have landed a sweet exclusive Tarbus the Tardigrade Blue Glow in the Dark 3-inch vinyl figure by DoomCo. YES, THEY GLOW BLUE baby. Our exact words back in May and on many occasions were “A new & interesting way of designing your first soft vinyl Designer Toy – via Virtual Reality! That’s exactly what DoomCo have done. Now with this GID blue and a price point worth shouting out about, Tenacious Toys at New York Comic Con would be the booth we’d run to. DoomCo Designs teams up with Squibbles Ink to bring forth the world’s first vinyl toy designed entirely in virtual reality: Tarbus the Tardigrade. Tardigrades (a.k.a. water bears) are microscopic creatures known to be among the most resilient animals on planet Earth. Tarbus the Tardigrade stands 3.25″ tall and is made of durable vinyl. Tarbus arrives glossy, unpainted, and ready for death-defying action! WELOVETTC will get you 10% off your first order. To obtain a second 10% code, you can sign up to the Tenacious Toys email list on their website, or you can join their loyalty program which can earn you points for every $ you spend with Tenacious Toys. Stay tuned for MORE reveals! Don’t be too salty just yet if you can’t make it to NYCC 2018 as if there are any left they will be made available at https://www.tenacioustoys.com/ after NYCC. Looking for the OG colour ways? Available for $18 (£13) in multiple colourways from the DoomCo store HERE.